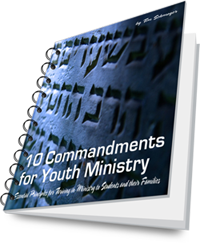 Essential Principles for Thriving in Ministry to Students and their Families. Download it FREE by subscribing today! There are 3 main ways to get all the latest youth ministry content delivered to you automatically, FREE of charge. Whenever we publish a new article, free resource, video, or game, we send out a quick D email to readers with the full content of the latest posts here. That way you can skim the message or read all the content without having to visit this website. If you’d rather receive only one email a week that summarizes the past week of articles, free resources, videos, games and more, you can optionally select the “Weekly Digest” option below. You can easily unsubscribe from this this service at any time. Subscribe to it by leaving your email address in the following field and confirming your subscription when you get an email asking you to do so. For those of you familiar with RSS, you can read full-length posts from Life In Student Ministry in your RSS Reader. Simply add it to your news aggregator and you’ll get notification every time something is published here. You can also subscribe to our RSS feed in your Google or Yahoo Homepage by clicking these buttons. Every week we publish the audio recordings from LIVE YM Talk as a free, downloadable podcast in iTunes. We also regularly publish free, downloadable youth ministry training videos to iTunes. Both can easily sync to your iPod so you can listen and watch them on the go. Privacy Note: Under no circumstances will I ever share your email address with anyone. Subscribing to this site will NOT sign you up for any offers from advertisers, spam or unsolicited emails. You may use the unsubscribe link in every email to safely remove yourself from this list at any time.